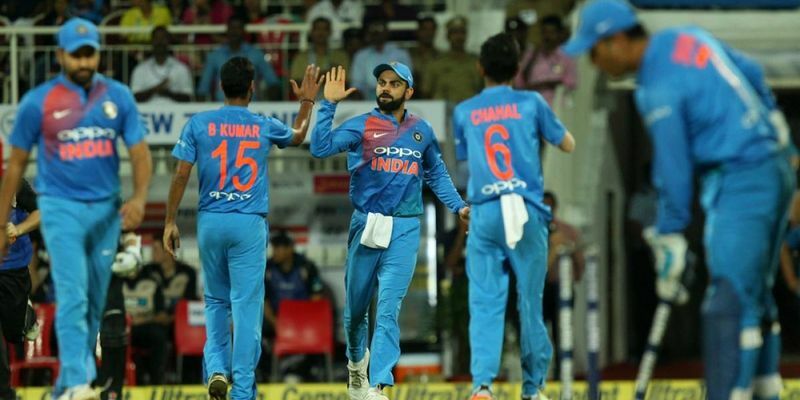 The Indian bowlers guided their team to a six runs victory against New Zealand in Thiruvananthapuram winning the three-matches T20I series in the process. In the rain affected match, the hosts managed only 67 runs in 8 overs which proved enough for them to win the decider. Brief scores: India 67/5 in 8 overs (Manish Pandey 17, Hardik Pandya 14; Tim Southee 2/13, Ish Sodhi 2/23) beat New Zealand 61/6 (Colin de Grandhomme 17*, Glenn Phillips 11; Jasprit Bumrah 2/9, Kuldeep Yadav 1/10) by 6 runs. The rain delay forced the decider of the T20I series to become an eight-overs affair in Thiruvananthapuram which hosted its first international game. Winning the toss, Kane Williamson invited the hosts to bat first and announced that the Kiwis had made one change with Tim Southee replacing Adam Milne for the game. Team India also made two changes with Axar Patel and Mohammed Siraj vacating their places for Manish Pandey and Kuldeep Yadav. Trent Boult, who claimed four Indian scalps in the second T20I in Rajkot, bowled a tight opening over and conceded just seven runs. The second over, bowled by Mitchell Santner, yielded the same number as it became evident that Shikhar Dhawan and Rohit Sharma were struggling. The pressure began to tell as Tim Southee sent both the openers back to the pavilion on consecutive deliveries to put India under severe pressure with the scoreboard reading 18/2 with two new batsmen at the crease. Kohli decided to target Ish Sodhi and got 10 runs off the first two balls but a mistimed shot to deep midwicket meant that his stay at the crease was short lived. Pandey joined Iyer at the crease and they added 9 runs to the total in the fifth over before the former smashed Sodhi’s delivery for a six. However, the leggie exacted his revenge on Pandey’s partner getting him caught at long off. With the help of a maximum from Hardik Pandya’s willow, India added 11 runs in the penultimate over before Boult gave away just six runs in the last over to restrict the Indians to just 67/5 in the allotted eight overs. Defending a small total Kohli handed the ball to Bhuvneshwar and despite going for six, the pacer got the important wicket of the hard hittingMartin Guptill. The Indians piled on the pressure in the next over as Bumrah not only got the wicket of the dangerous Colin Munro, he gave away just three runs in the over to restrict the visitors to just 11/2 in the powerplay. After a tidy Yuzvendra Chahal’s over, Glenn Phillips tried to release some pressure as he scored two boundaries in Bhuvneshwar’s second and last over which took the Black Caps’ score to 26/2 after four overs. Kuldeep Yadav swung the match back in India’s favour with Phillips’ wickets after Williamson had been sent packing thanks to a Pandya direct hit. New Zealand needed a chasable 32 runs in the next 18 balls but Chahal, who gave away just three runs in his last over, put the hosts in the driving seat. The penultimate over saw the game swing both ways with Bumrah getting rid of Nicolls on the first ball before leaking 10 runs. Needing to defend 19 runs off the last over, Kohli handed the ball to Pandya who, despite picking up an injury mid over, held his nerve and helped India register six-run victory.